This is from episode 2 of Wonder Woman season 1, and kicks off Lynda Carter's amazing sleepy streak on the show. Wonder Woman is searching for Steve Trevor, and manages to locate the house he's being held captive in. She sneaks in, thinking she's going to rescue Steve. Wonder Woman emerges from the curtains and sees a bound and gagged Steve. With almost no time to react, The Baroness appears behind Wonder Woman and knocks her out with a very powerful sleeping gas. 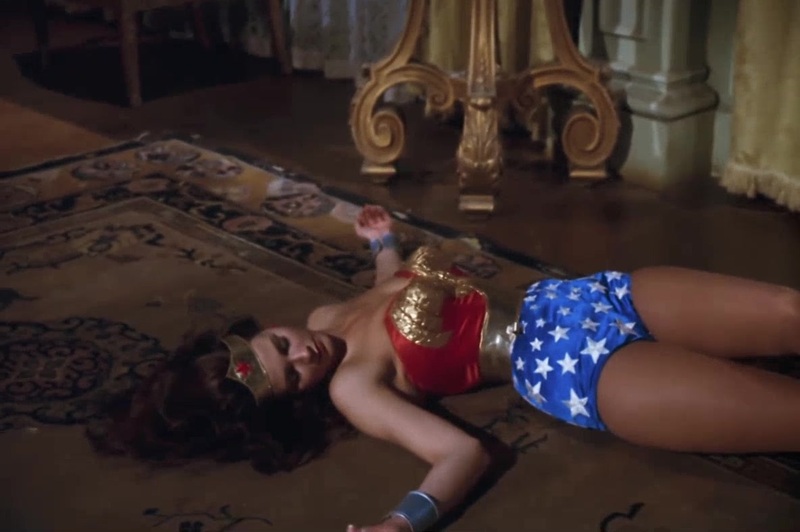 The gas acts really fast, and Wonder Woman collapses to the floor. The scene happens a little too fast, but we do get some nice sleepy shots of Wonder Woman. She wakes up in chains.